This story was all too predictable. As New York State Attorney General, Eliot Spitzer operated as an arrogant jerk. Spitzer’s M.O. was to file civil law suits against citizens for no violation of the law, and coherse a out court settlement. 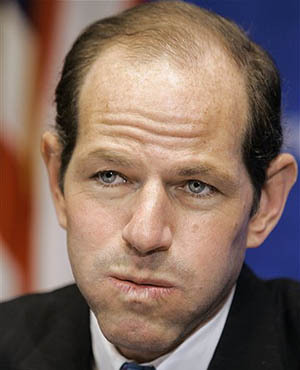 Spitzer legal extortion tactics won him media praise, election to governor in landslide and stratospheric approval ratings. ALBANY â€” Gov. Eliot Spitzer waited all of 39 days before turning on his fellow Democrats and attacking legislators in their home districts. Next question: Will he try to take out Assembly Speaker Sheldon Silver? Spitzer’s ego is simply too big to fit into Albany. His personality too abrasive with which to work. The only good thing I can say about Spitzer is that is making George Pataki look good, and that is quite a feat.